Mazama students show how program is helping them prepare for the future Gov. Kate Brown has a vision for Oregon students: they finish high school with a plan in mind for their future. STEM&M is a partnership between Mazama with Oregon Tech and stands for Science, Technology, Engineering, Math and Medical. Students follow specific pathways toward college degrees and careers. After high school, it offers $9,500 in total scholarships to Oregon Tech and preferential admission into Oregon Tech programs if students choose to go there. Currently 78 students are enrolled in STEM&M, and freshmen interested in joining next school year will soon apply for the program. About 30 students per class at Mazama participate in STEM&M. Earlier this school year a team from Klamath County School District and Oregon Tech resented at a national conference, explaining how STEM&M is unique. 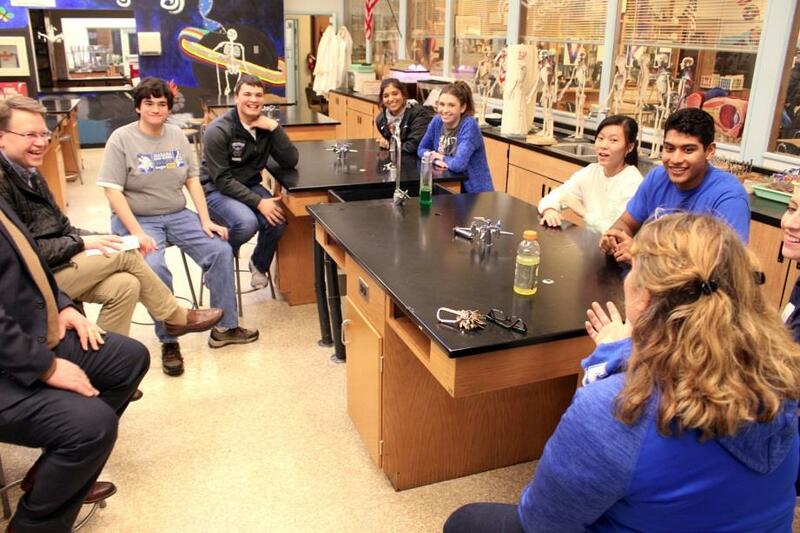 Seven of those motivated students gave Gill and Capps a tour of Mazama’s STEM&M classrooms, courses and programs. Students led Gill through the Mazama metal shop, auto shop, robotics and engineering lab, chemistry lab, manufacturing lab and met back in the biology lab. At each, they explained the programs and classes and answered questions. Back at the biology lab, everyone sat on stools and chatted about the program, with Gill and Capps asking questions of the students. Browder spoke about taking dual-credit courses at Mazama and taking a course at Oregon Tech over the summer. The partnership between Mazama and Oregon Tech is a key STEM&M’s success. Gill was impressed by the collaboration, too. Gill asked what the state could do to help STEM&M succeed. Both Nickerson and the students agreed it would be great to have more options outside standard curriculum. Nickerson pointed to a need for more classes on coding, engineering and manufacturing – all careers she sees growing in the future. “Being able to have more classes to choose from in your pathway would make it a lot more enjoyable, fun, and you’d have more options,” Lease said. Some students have found a sense of community in STEM&M. Segure and Volpe are the two Chief Science Officers for Mazama. Together they are planning events like the STEMonstration, to get underclassmen thinking about their future and learning about STEM fields. Segure said he and Volpe were not friends before STEM&M, but are good friends now. Capps asked how STEM&M will help the Klamath community. While Nickerson supports helping Klamath grow, she also hopes her students will see the world. She said many Klamath residents leave the area only to return a few years later. Press release from the Klamath County School District. Images by Samantha Tipler, Public Relations, Klamath County School District.